Mason is an eight-year-old male pug who was bred by Doris Aldrich of Kendoric Pugs in western Massachusetts. 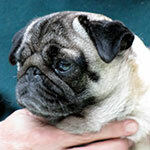 Mason finished his championship and sired one litter of beautiful pugs. He has lived in Boston, Dallas, and now Manhattan with his mom and dad, Annie and Nick Walters. 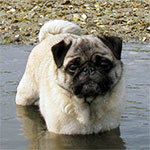 Lizzie is a four-year-old female pug who was also bred in Western Massachusetts. Like Mason, Lizzie has had one litter of pugs. She came to Manhattan only a year ago and happily shares Mason’s home with his parents. 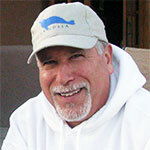 Andrew Newman is a renowned graphic designer whose office first was in Manhattan and now is on Cape Cod. His work includes all aspects of design for print and web. He is also the creator and designer of Cape Card, whose cards and prints feature the ubiquitous codfish, as well as a couple of pugs named Lizzie and Mason. His work may be seen at www.newmandesign.com and www.capecard.net. 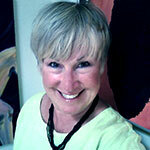 Sue Newman is a former English and drama teacher who freelances as an editor, copywriter, and photographer. She and Andrew have collaborated on many design projects, but this is their first book project. She is the author of the blog, “A Pug’s Voice” at www.apugsvoice.com. Mason and Lizzie, our two remarkable Manhattan grandpugs, live with us on Cape Cod for the summer. They fill our days with laughs, fun, challenges, joy, anxiety, and love. Anyone who lives with or knows a pug understands this. Returning to their home each fall, they take pieces of our hearts with them, but leave their indelible footprints with us. This small book is an homage to their summers on the Cape. Known as the clowns of the dog world, pugs entertain and delight us. Living with Mason and Lizzie for a summer was the inspiration for this photo journal written by their grandparents. The photos are casual and unposed, capturing their daily activities on Cape Cod. If you are a pug lover, adult or child, this charming book is one to treasure and revisit.